If you’re like some pet parents who love snuggling up with their dogs right on their beds you know that you’ll need the best dog stairs for your bed. Responsible pet parents know that dogs jumping up onto and down from their master’s bed can be dangerous. This is especially true if you have a pet that has certain musculoskeletal problems. Even an otherwise healthy and highly active dog can still suffer costly injuries if it loses its footing while getting onto or off your bed. Picking the best dog stair should, thus be an important activity for such pet parents. And we’re here to help you zero-in on what could be the market’s best dog stairs for your bed. 3. Dog Steps by Cozy Pet by Dallas Manufacturing Co.
It’s nifty, modern-looking, and a really great way to get your pet onto your bed or any other elevated platform not higher than 20 inches. That’s what the Solvit PupSTEP Pet Stairs has to offer. The PupSTEP is perfect for puppies and small breeds of dogs as the risers are only 4.75 inches high. It comes already preassembled and folds easily once your pet is done going up and down your bed. The treads are fully carpeted and the risk of falling is greatly reduced because of the integrated side rails that technically cover the space occupied by risers and treads. 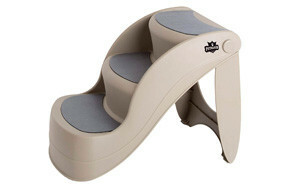 The feet come with rubber grips, too, to keep the pet stairs securely in place. Its durable plastic construction also makes it easy to clean and maintain. It may cost you a bit, but considering its sturdy and durable construction, then you’ll know it’s more than worth it. If you’ve got a hound that weighs over a hundred but not over 150 pounds, then the Pet Gear Easy Step II Pet Stairs is a great solution. This is especially true if you have a bed or a couch whose resting platform is not higher than 16 inches off your floor. Made of sturdy and heavy-duty materials, the Easy Step II will never balk with the weight of your dog planted squarely on its wider and deeper treads. The carpeted treads can be easily removed for washing while the feet of the Easy Step II come with rubber grips. It doesn’t have a folding design but the various components can be easily snapped together without the need for any tools. It costs less than the PupSTEP, too, making it a great option for those seeking something practical yet very sturdy. Dog Steps by Cozy Pet by Dallas Manufacturing Co. There are concerns about the use of cardboard in the manufacture of dog stairs. However, Dallas Manufacturing Co. was able to create a technology that substantially strengthens the cardboard-based Dog Steps by Cozy Pet. The Dog Steps features the DuraCore technology which utilizes cardboard materials designed in a very different configuration to give it structural rigidity and sturdiness. The Dog Steps can easily handle dogs weighing up to 150 pounds yet only weighs less than 6 pounds. It even comes with an integrated tote handle at the back to allow for ease of carry. You cannot fold it, though, and the width of the stairs is only 14.75 inches which is quite narrow if you consider its maximum height of 20 inches. Nevertheless, the Dog Steps is still a good choice if you want something really lightweight, although it can be priced higher than the Easy Steps II. Pet parents looking for something softer like a mattress for their dogs to step on can consider the Zinus Step Easy Pet Stairs. While it is one of the most expensive dog stairs in this list, it is nevertheless one of those that come in a variety of sizes so you get to choose the right one for your hound. The high-density foam used in the manufacture of the Step Easy is certified by the CertiPUR-US while its cover is removable and washable. Our main concern was that the different sizes didn’t come with the recommended weight capacities. This was echoed by some pet parents who have bought the Step Easy. The treads are a bit narrow, too, complicated further by a high riser. Overall however, a lot of pet parents consider the Step Easy as a great dog stair especially for pooches that may have problems in their joints. 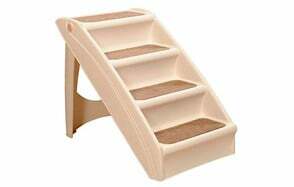 Like the Step Easy, the Majestic Pet Portable Pet Stairs for Cats and Dogs is made of durable and sturdy foam inserts instead of the usual cardboard construction or even the molded plastic body of some products. 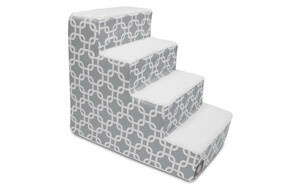 The Majestic features a 16-inch wide stairs plus a machine-washable, upholstery-grade cover. Like the Step Easy, there are questions about the Majestic’s weight capacity with some saying 20 while others saying 40 pounds. It’s more likely 30 pounds, however. One thing that pet parents found is that the Majestic should be sturdy enough for your dog provided it doesn’t stay that long on one particular step. On the plus side, the Majestic is available in 6 color designs so you can easily pick one that matches your interior home décor. The Easy Step III is essentially the same like the Pet Gear Easy Step II Pet Stairs with the only difference being the Easy Step III is composed of three steps. This makes it a bit higher by about 3 inches, making it ideal for higher platforms. Unlike the Step Easy II, the III doesn’t have a folding design. Instead it is designed to be easily assembled by snapping on the different components. It’s got carpeted treads and rubberized feet for better security. For just a few dollars more from the price of the Easy Step II, you will already have a higher and stronger dog stair as the Easy Step III is fully capable of holding up to 150 pounds. It’s not really that portable, though. The Paws & Pals Dog Stairs Pet Steps may be an inexpensive pet stairs but it is designed for hounds weighing up to 175 pounds. The Paws & Pals has the highest weight capacity in this list. Unfortunately, there have been issues about its sturdiness, putting into question the accuracy of the 175-lb weight capacity. Nevertheless, at less than 2 pounds the Paws & Pals is lightweight enough to be tossed right into you stockroom when not in use. You can also remove the sheepskin cover for easier washing and cleaning. The main issue is that the stairs is only 14 inches wide, although its 16-inch maximum platform height should make it safe enough for your pet. It really is for the more practical pet parent who may have a smaller breed of dog. Designed like ladies’ high heels, the PETMAKER Folding Plastic Pet Stairs is as elegant as it is functional. The PETMAKER may only accommodate dogs weighing up to 80 pounds, though and its width is rather narrow at 14 inches. However, it sure comes with deeper steps allowing for greater stability for your pet as it goes up to your bed or even couch. It is fully collapsible allowing for easier storage and is lightweight enough to be carried around even on trips. Each tread has grip mats for your pet’s paws. Unfortunately, it is not advisable to use it on hardwood or even on tiled floors as the feet don’t come with non-skid materials. There were also issues about the hinge getting loose. These can be serious safety issues limiting the full functionality of the PETMAKER. It’s a lovely dog stairs, nonetheless. It’s never easy to choose a contraption for our dogs especially when we’re also concerned for their safety. We have to study carefully our choices to determine the best possible fit related to our dog’s unique characteristics. With this buying guide and FAQ, we’re confident you’ll have the correct knowledge to base your decisions on. Deciding to buy dog stairs for your bed entails a lot of thinking. There are a few considerations that you need to think about before finally deciding on a particular product. Puppies will have shorter legs so you will need stairs that have lower or shorter risers. If it is too high, they may lose their grip on the treads leading to injuries because of falls. You will also need to go for dog stairs that have wider and deeper treads as puppies’ gait are still not that balanced and stable. The same is true with dog breeds that have shorter legs. Elderly dogs will also require a very different kind of stairs especially if they already have joint issues. Lower and wider steps should provide your senior dog with a more stable platform upon which to step on. It is important to have a very clear idea of your dog’s weight so you’ll have a baseline on the type of product to get. Ideally, you should get one that has a maximum weight capacity of at least 20% of your pet’s weight. For instance, if your hound happens to weigh 60 pounds, then getting dog stairs with a maximum weight capacity of about 80 pounds should suffice. Now if you have a multi-pet household, you’d have to consider the possibility that two to 3 dogs may be climbing onto the stairs at any one time. That being said, you’d have to factor their combined weight. Your dog’s current health status should also be considered when purchasing a dog stairs. If there is arthritis, hip dysplasia, or any other health condition that may make it difficult for your pet to climb onto and get down from the stairs, then choose one that will be easier to climb on. You’d want one that has lower risers and wider and more stable treads. We don’t really recommend getting super-soft treads as any shift in your dog’s weight can lead to loss of balance, risking falls. You can go for plastics or even cardboard, but make sure the treads are padded with a non-slip material to secure your pet’s footing. Your type of floor will dictate whether the dog stairs you choose should have non-skid bottoms or not. If you have hardwood or tiled floors or any other substrate that makes the surface rather slippery a dog stairs with non-skid bottom is an absolute must. If you have a well-carpeted floor in your home, then a rubberized bottom is not really that necessary. Still, getting non-skid-bottomed dog stairs offers you better flexibility. This will address the height of the dog stairs that you want to buy. If it is for your bed, then you need to take into consideration the height of the top of your bed. Ideally, the top step of the dog stairs should be in-level with the top surface of your bed. It may also be lower but should not be more than the height of an individual riser. To summarize, these considerations – age, breed, weight, and health status – should help you look for dog stairs that have the right height of risers and correct width and depth of the treads. This should also help you choose the right material and bottom grip for your dog stairs. Just because you bought a really expensive, classy, and sturdy dog stairs doesn’t mean your pet will use it immediately. Like everything else, you need to teach your dog to become familiar with its stairs. The very first step is acclimatizing it to this contraption by leaving the stairs for your dog to sniff and poke around. The idea is for your canine friend to look at the pet stairs as a normal part of its daily existence. Once your pet is confident with the dog stairs, you can start training your dog. Do it slowly and get ready with plenty of treats. Assign a ‘target’ step to be accomplished. If you bought a 3-step staircase, then on your first training session your goal should be the 1st step only. Entice your dog to follow a treat or even its favorite toy so that it steps onto the first tread. Always praise and reward your dog every time it accomplishes this. Practice going down from the first step. Do this a couple of times before you start going up the next step of the stairs. Repetition can help your dog learn and master going up and down its stairs. Take your time as different dogs have different learning capabilities. While dog stairs offer a safer means for your pet to climb onto your bed or any other elevated platform, it is not really advisable for all types of dogs. For instance, if you have a pet that is rather skittish when it comes to stepping onto a few treads or it has difficulty flexing its joints to raise it on the next higher step, then a dog stairs is not for you. Your hound may need a dog ramp instead. Dog stairs are perfect for pets that are not really scared of climbing up and down an elevated platform as well as those without stability or balance issues or even musculoskeletal problems. These are also ideal for homes that may not have sufficient floor space. On the other hand, dog ramps are the best solutions for canines that have serious musculoskeletal problems or those that are not trained to climb stairs. Dogs that have painful joints will want to minimize movement in a vertical plane. By allowing them to walk on a gentle incline the joints move at a relatively horizontal plane, minimizing pain or discomfort felt by the dog. Regrettably, dog ramps require sufficient floor space as they need to be exceptionally long to be anchored on a particular part of your room. The length is also dependent on the height of the platform you want your dog to reach. If it is high you will need a longer ramp to maintain a gentle slope. Why Should You Use Dog Stairs? There are plenty of reasons why you should use dog stairs. First, if you have dogs that are already in their senior years or may have arthritis and other joint problems, they may need dog stairs to get onto an elevated platform, although we mentioned above that it is perhaps better to get a dog ramp. Dog stairs are assistive devices allowing our dogs to reach an elevated position without necessarily jumping the entire height of the platform. This helps minimize injuries due to falls. The same is true when getting onto your car or even at the back of your truck or SUV. Just think of it this way: if you need to get to a higher position you’ll do less work going through stairs rather than scaling the side of this elevated platform. The same is true with dogs. How Do You Store Dog Stairs? The storability of dog stairs is dependent on its design. There are those that can be easily folded with the legs easily folded into the stair casing. From this, you can store it under your bed or propped up behind your door or even inside your closet. There are also those that, while they may not be foldable, can be easily disassembled even without the use of tools. Think of these like your Lego bricks which you can easily snap on and off for greater portability. And then there are those contraptions that have fixed designs. In such cases you may want to look for a dog stairs that have a relatively smaller footprint, otherwise, you’d really have to make up some space for it. Any Weight Restrictions with a Set of Dog Stairs? Different manufacturers have different maximum weight recommendations for their respective products. As you may have noted in our list, there are those who rate their products as fully capable of holding dogs up to 175 pounds while some are more modest in their weight ratings. Still, there are those that do not provide weight restrictions at all. In such cases, you may want to read customer reviews as they typically will be sharing their experiences related to the use of a particular dog stair. Again, it is crucial to never push your luck. If the product says it has a weight limit of such a number of pounds, then, by all means, observe this. The risk of injuries related to falls secondary to an unstable structure is simply too great even if the dog stairs you’re planning to buy is so stylish and very cheap. Getting a dog stairs for your bed or any other elevated platform helps keep our pets safe from injuries related to falls. It also makes for easier movement, allowing them to reach us without us having to carry them. With these 8 best dog stairs for your bed, you’re now more empowered to choose the right product for you and your canine friend.